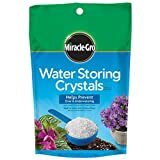 Help prevent over-and under-watering of plants with Miracle-Gro Water Storing Crystals. Ideal for indoor and outdoor plants, the crystals reduce water stress in plants to help protect them from heat and drought. Simply mix with soil to reduce the amount of watering needed; then when you do water plants, crystals will swell to absorb the water. Your plants will receive the right amount of water they need to thrive.